Are you looking for the perfect tofu egg salad recipe? 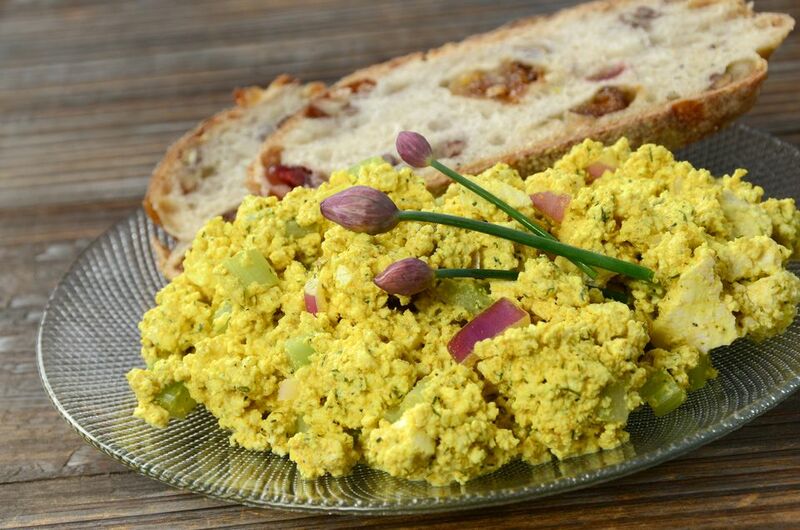 With a tablespoon of mustard to give it a yellowish hue, this vegan tofu egg salad recipe looks and tastes like egg salad. With nothing but tofu, relish, mustard and spices, this simple tofu egg salad recipe is completely vegetarian, vegan, and also gluten-free (though you may want to check the ingredients on your garlic powder and onion powder for hidden gluten-containing additives). It has all the traditional ingredients of an egg salad recipe, just swapping out the egg and using tofu in its place. If you browse around, you'll see that many vegan "egg" recipes call for white pepper, which does lend an "eggy" taste and aroma to vegan tofu recipes. So, if you have some white pepper on hand, add a pinch to this recipe. I didn't include it in the ingredients list, because it's not something I usually keep handy personally. If you like making creative vegetarian sandwiches for lunch, check out more fun vegetarian sandwich ideas here. In a medium-sized bowl, gently mash the tofu with a fork until it has the consistency you prefer. I like to have a few little chunks of tofu, but some people prefer a more crumbly egg salad or a more chunky texture. Up to you. Err on the side of a bit smaller than a bit larger, as it will carry the rest of the flavors better. Add the mayonnaise, sweet pickle relish, lemon juice, and diced celery, stirring to combine well. Then sprinkle with the garlic powder and onion powder and stir in the mustard. Taste and adjust seasonings to taste. You might want to add a dash of salt if you're used to saltier foods. Finally, sprinkle with a dash of paprika for a bit of color and garnish, if you'd like. Serve your tofu egg salad on lightly toasted bread with lettuce and a couple of tomato slices for a vegan "egg" salad sandwich or spread on crackers for a casual vegetarian hors d'oeuvres. This recipe is vegetarian, vegan, and gluten-free (but only if you eat it as a salad and not as a sandwich, of course, or you can use gluten-free bread).